Loughborough Students’ ground remains an unhappy hunting ground for Fylde after this fifth successive defeat there. In a very even and tryless first half, it looked as though the Lancastrians could well overcome a fit and determined Students squad, though the second half was a different story as the home side dominated possession and territory to subject Fylde to a disappointing ‘nilling’. Fylde started very strongly and dominated the early exchanges. They pressed deep inside the Students’ half but the home defence was resolute. The Fylde pack shaded the scrum battle and pressurised the Students in the tight exchanges. The home team’s gritty work at the breakdown, especially through their number eight Suvwe Obano, earned them turnover ball. Much of the action was played out between the two 22m lines in the first 40 minutes and the Fylde defence was excellent throughout, even if their attacking was sometimes rather too lateral. The deadlock was broken in the 38th minute, when a Fylde player offended and Loughborough full-back Will Kaye opened the scoring with a penalty kick. Immediately Fylde responded and camped close to the Students’ line in stoppage time. After a series of penalties to Fylde, Loughborough prop Jarod Leat was sinbinned. Somehow, the Students managed to hang on and take the slender 3-0 advantage into the break. Fylde would have been very disappointed that they hadn’t used their superiority to build some kind of lead. Although they still had a man advantage for the opening minutes of the second half, Fylde were unable to exploit this. In the 47th minute, Kaye kicked his second penalty to double the lead. Back to 15 players, Loughborough gradually took control of the match and tightened the screw. In the 60th minute Kaye converted his third penalty but the crucial score came immediately after the restart as the visitors began to chase the game. Fylde launched their backline but Students’ winger Jack Stapley read one of the passes, intercepted and scooted through for the touchdown. The conversion was missed but Loughborough had built a 14-0 lead. By this time, an ever more desperate Fylde were really under the cosh. The coup de grâce was applied in the 67th minute. The Loughborough pack set up a maul near the Fylde line and drove forward. It collapsed and referee Dan Parrott awarded a penalty try. To compound the misery, visiting flanker Will Hopwood was despatched to the sin bin. Even at 21-0 down, the Fylde players didn’t let their heads drop. They had a final few minutes of pressure near the Students’ line but were unable to put any points on the scoreboard before the final whistle was blown. Loughborough gathered a useful four points from the game, lifting them above Hull Ionians in the battle at the bottom of National One. Fylde, meanwhile, are now 12 points behind them at the foot of the table, having travelled back to Lancashire empty-handed. 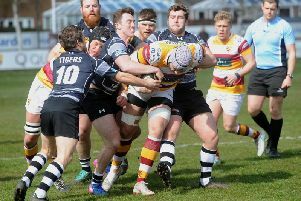 Fylde’s final game of 2017 is against Caldy at the Woodlands on Saturday. FYLDE : Carleton; Hadfield, Wilkinson, Fowden (Smith 60), Grimes; Dolly, Nicholls; Richardson, Burtonwood (Gregory 52), Lewis (Irving 67), Garrod (Ashcroft 67), Parkinson, Vernon (Corrie 55), Hopwood, Fairbrother.